The sad remains of Maroochy hiding in the long grass at Murrumba Downs / Kallangur on 12 April 2003. 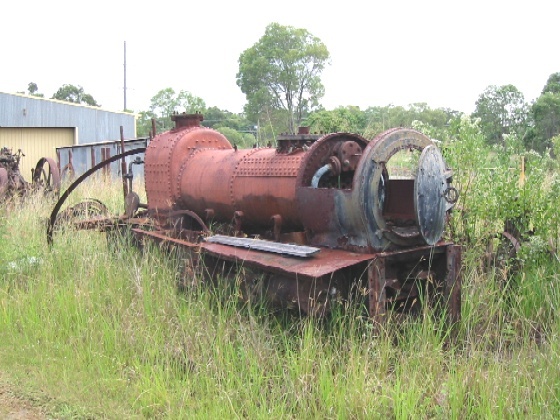 This locomotive was delivered new to the Moreton Mill, Nambour, where it received the name ‘Maroochy’ after the local Shire. Maroochy spent its entire working life at Moreton Mill, trundling empties out to the fields and then returning to the crushers with long loads of harvested sugar cane. The Moreton Mill tramway system was popular with rail enthusiasts as it was one of the most accessible tramway systems, being located only 100 kilometres north of Brisbane and close to the coastal holiday towns of Noosa and Maroochydore. The Moreton Mill system was also notable for having a major route to the crushing plant threading through the heart of the town’s busy commercial district. Maroochy was withdrawn from cane haulage duties at Moreton Mill by 1963. The loco was saved for preservation and it subsequently passed through a number of owners and locations, but the years have not been kind to ‘Maroochy’. Indeed its current status and location is unknown and it is feared as scrapped. Maroochy was photographed at the Rocky Point Sugar Mill in 1976 (as per image below) and had passed to a new owner in Woongoolba by 1979, changing hands again in 1981 and moving to Redbank Plains. Around 1986 a further ownership change occurred, with Maroochy acquired by a collector and transferred to his industrial premises at Murrumba Downs / Kallangur, north of Brisbane. The owner kindly showed me his collection at Kallangur on 12 April 2003. During that visit he explained that Maroochy had been dismantled to begin repairs, but was then assessed to be beyond repair. As per the photo above, my visit found Maroochy stored outdoors, stripped of chimney, side tanks and cab (probably all heavily corroded) with no further work planned. The Murrumba Downs / Kallangur industrial site was sold for redevelopment and cleared in 2007 and I understand Maroochy was sold around this time; there have been some suggestions that it was disposed as scrap metal although I find it hard to believe the former owner would have allowed Maroochy to be destroyed. (I suspect the residents of the Shire of Maroochy would find that an unsatisfactory fate for their namesake locomotive!) I’ve had numerous email requests from various rail enthusiasts asking after Maroochy’s fate, so further information about Maroochy’s status or fate is most welcome. As for the Moreton Mill and tramway system – alas these close in 2003, with the sugar refinery since demolished and the mill site redeveloped. Fortunately the Moreton Mill cane tramway route through the Nambour town centre earned a place on the National Register of Historic Places and remains preserved, albeit now an unused and isolated remnant of the once extensive tramways in the Nambour district. The local Nambour Museum has a fine collection of locomotives and other artefacts from Moreton Mill and tramway system; perhaps if Maroochy does survive then this museum would be a good home for its static restoration and display. An excellent source of information on the various Hudswell Clarke steam locomotives employed in Australia and Fiji is ‘Salute to the Hudswells’ by Ian Stocks, David Mewes and John Browning. Page 132 of this book provides some history for Maroochy. 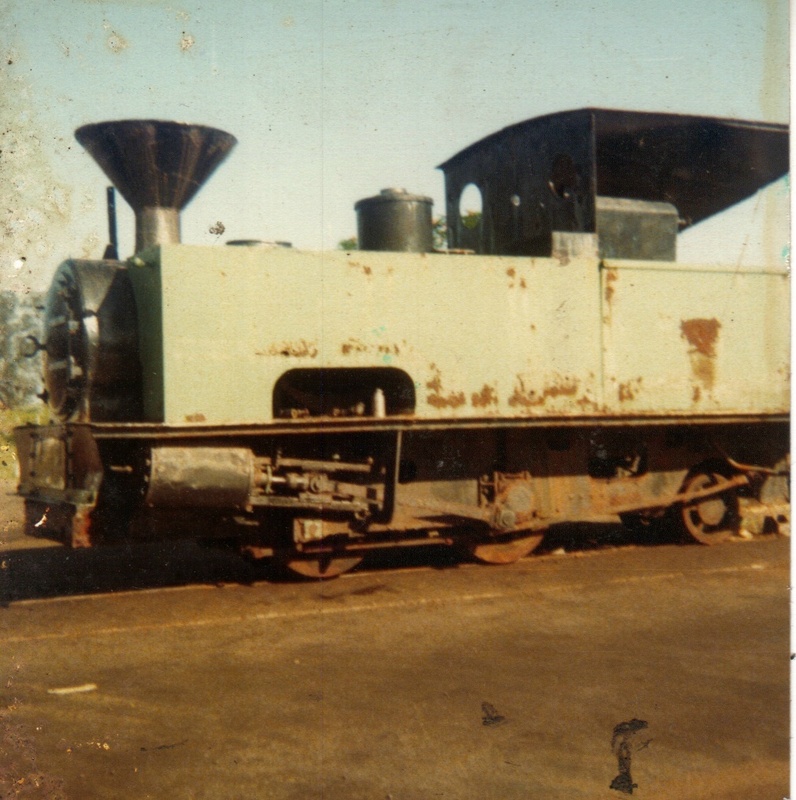 ‘Maroochy’ photographed at the Rocky Point Sugar Mill in 1976; this photo was kindly contributed by Thomas Hurley. The side tanks & chimney don’t look like Hudswell Clarke originals.